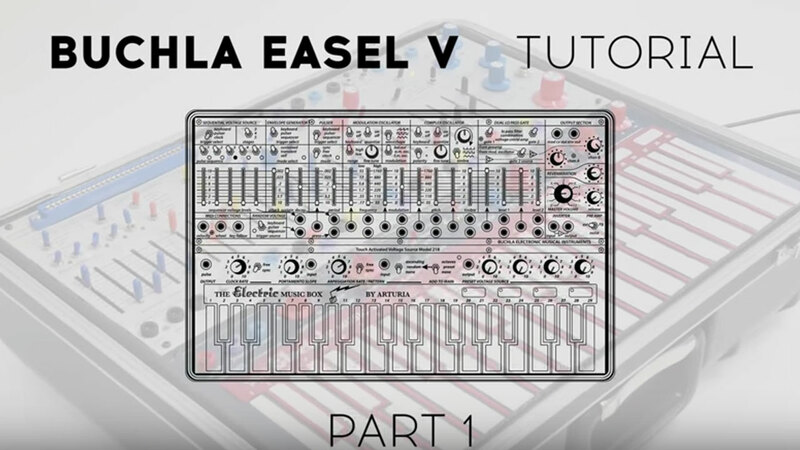 BUCHLA EASEL V TUTORIALS FOR ALL!!! French music software & hardware creators Arturia have created a series of tutorial videos demonstrating the features and functions of their recently released Buchla Easel V, a software recreation of Don Buchla’s legendary Music Easel. The in-depth tutorial – hosted by Glen Darcey – is presented in 3 parts, covering its layout, modulation and control sources, as well as the additional new features. Recreating the leftfield brainchild of visionary synth legend Don Buchla, the Buchla Easel V maintains the unique, inspirational approach to sound creation that made the original a true cult icon. Over and above the standard parameters synth enthusiasts expect to find on an instrument, the Buchla Easel V provides a recreation of Don’s innovative slider system. Each slider provides a unique voice, overtone, animation, shape, or color to the sound, opening up an exciting, fresh way of sculpting sound, and giving even seasoned professionals a chance to rediscover the joy of synthesis. Authentically recreating Buchla’s experimental, West coast sound was no small feat, and pushed the limits of TAEⓇ: Arturia’s exclusive analog emulation technology. The incredibly accurate modeling – mapping out and reproducing the nuanced response of every analog component within the instrument – makes Buchla Easel V a truly cutting edge product. This level of intense detail means that each voice of polyphony requires around 20% of an i7’s processor power. While famed for the accuracy of their software emulations, Arturia also rework their instruments to include optional features that would have been impossible on the original instruments. Arturia have created many subtle improvements to the interface of the Buchla Easel V, in the true spirit of Buchla’s legacy. They have also included an extra, ground-breaking synth engine: Gravity. Using an interactive physics engine to create animated, organic sounds, the addition of this powerful new synth engine makes Buchla Easel V a synth that’s truly out of the world. Buchla Easel V is one of four new stunning vintage instrument recreations that are included in V Collection 6 – Arturia’s groundbreaking retro synth and keyboard package. Containing 21 instruments, each modeled after a keyboard that changed the face of music as we know it. Within V Collection, you’ll find meticulously modeled analog synths, digital powerhouses, incredible performance keyboards, acoustic and electric pianos, organs, a string machine, and even a sampler. Breathing life back into the most iconic keyboard instruments of all time, V Collection is the ultimate creativity launchpad, and an essential studio tool for the modern music producer. To start exploring the West coast synth sound, hear the Buchla Easel V in action, and for a quick rundown of the features, check out this entertaining overview video. Remember, as part of our special launch offer, the Buchla Easel V is 50% off until January 10, 2018.